Instagram/Barak ObamaBarack and Michelle Obama on their wedding day in 1992. Wednesday marked Barack and Michelle Obama’s 26th wedding anniversary. 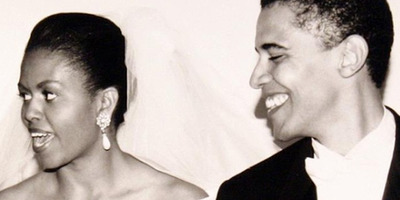 “Happy anniversary, @MichelleObama. For 26 years, you’ve been an extraordinary partner, someone who can always make me laugh, and my favourite person to see the world with,” Obama wrote in the post, which included a picture of his wife looking out an aeroplane window. “Each day I’m with you, I’m reminded of what a treasure you truly are to us all,” she added. According to a 2007 Chicago Sun-Times article, Michelle initially tried to set Barack up with friends because she didn’t want to get involved with a subordinate at work. But she agreed when he asked her out about halfway through the summer. Their first date was to see Spike Lee’s movie “Do The Right Thing,” followed by the Art Institute and a stroll down Michigan Avenue. “He said, ‘That kind of shuts you up, doesn’t it? '” Michelle recalled.